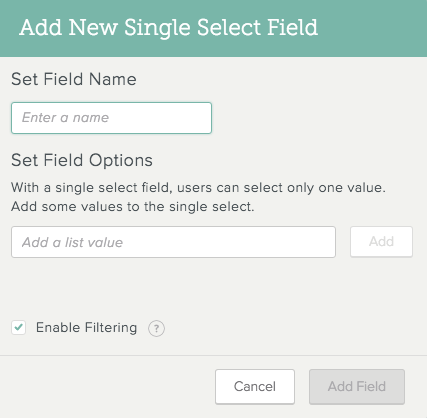 This article describes the standard fields available for Lists in SalesforceIQ. Standard fields are fields that you can edit yourself (unlike Intelligence Fields, which are populated automatically—learn more here). The sections below describe each standard field in detail. Note: When you create a List, the Status, Owner, and Created field are added to the List by default. Learn more here. Scroll to the far right of your List Grid and click Add a Field. Note: You can also click the downward-pointing arrow to the right of any Grid field header and click Add New Field. Click Standard, and then click the field type. Set the options for the field. See the sections below for details. Note: All standard fields except the File field include the Enable Filtering option. 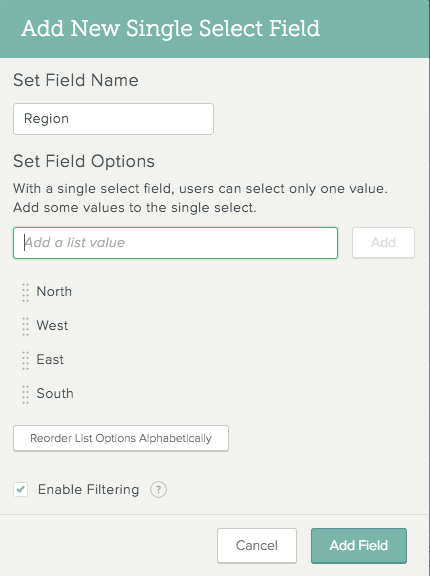 Check this box to include the given field as an option in List filtering. After you have finished adding fields, click Save. 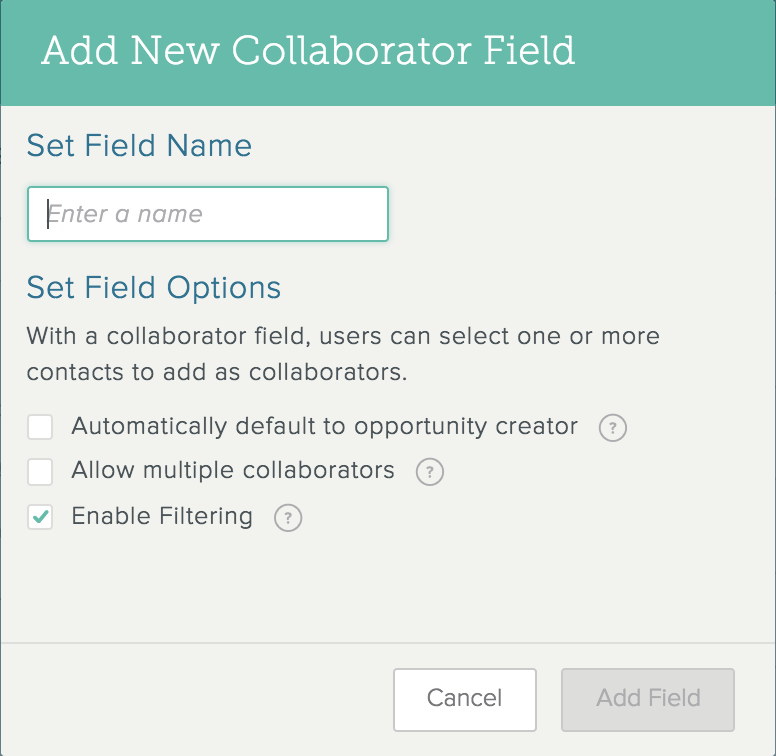 Use the Collaborator field to show who added a List object (opportunity, lead, etc.) to your List. This can help you figure out who has ownership over this deal or opportunity. Automatically default to [list object] collaborator—Check this box to set the default collaborator as the person who created the List. This replaces the Creator Intelligence Field. Note: If you set this field to default to the List object creator, you can always edit it to show a different collaborator for any given List object. Allow multiple collaborators—Check this box to allow multiple collaborators to appear in the field. By default, you can enter only one collaborator in the field. 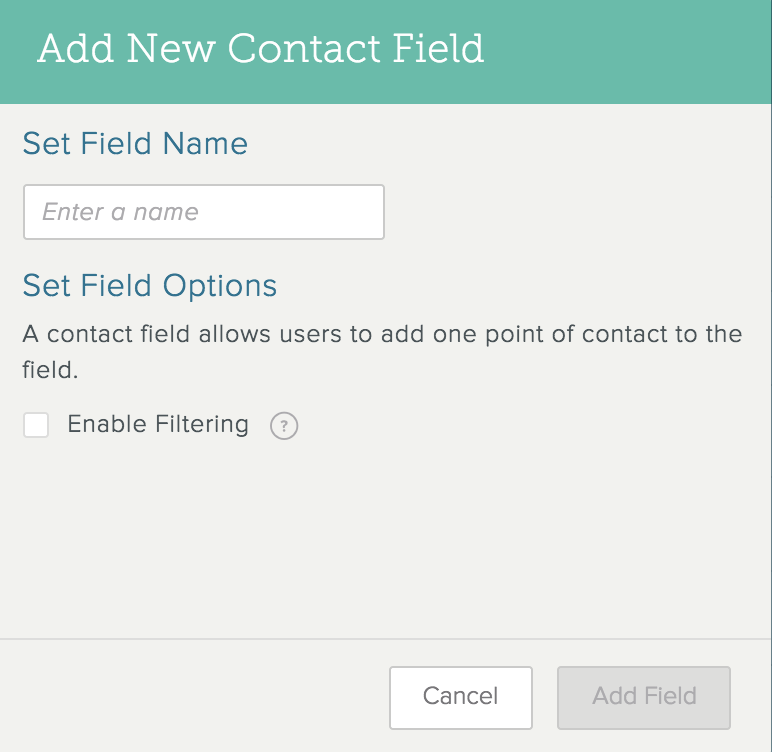 You can add fields to the Grid that link to new or existing Contacts in your SalesforceIQ address book. This Contact field type is great for when you want to reference a referral or source relevant to one of your Contacts or Accounts. You can also add Contact properties (i.e., phone number, email address, social media pages, etc.) as a field in a Grid. For more information, click here. You can use the Date field to show when a List object entered your pipeline. 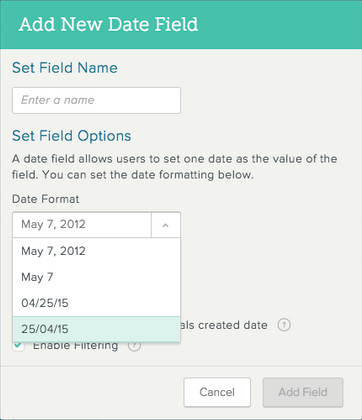 For each object you add to the List, the Date field shows the date the object was created by default. You can change the date shown in this field, as well as the date format. Date Format—To change the date format, click the list and select a different format. There is an international month/day/year option, as well (highlighted in graphic above). Automatically default to [list object] created date—Check this box to set the default date as the date the List was created. Note: If you set this field to default to the List object creation date, you can always edit it to show a different date for any given List object. You can upload files (from resumes to spreadsheets, notes to images—anything!) directly into a List in SalesforceIQ. 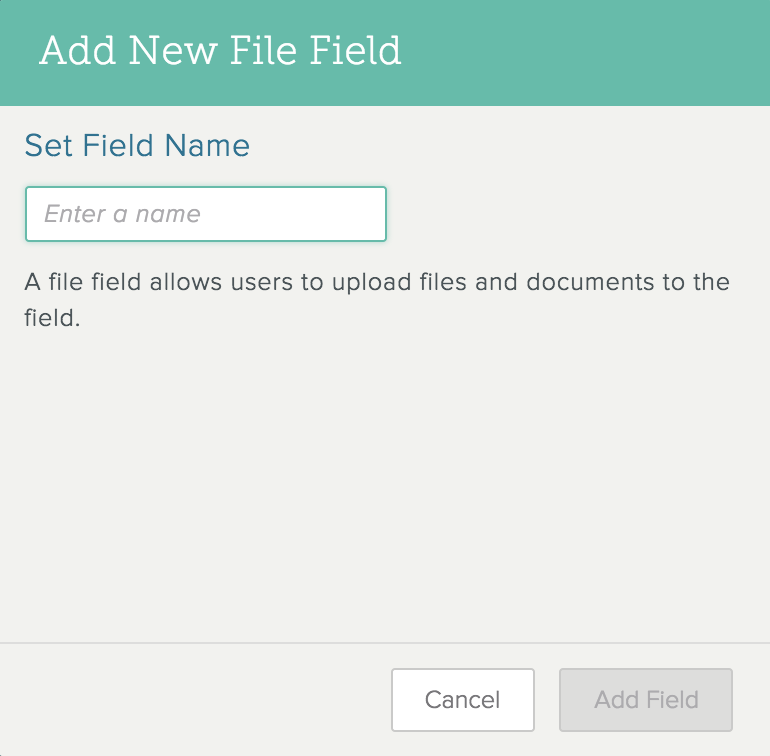 After you create a File field, you can click that new field for any lead, recruit, etc. to upload a file associated with that Contact or Account. You can click on the file name in either the Grid or the Stream to access it. The maximum file size you can upload is 10MB. You can't use the File field to link to an online file such as a Google Doc. Instead, we recommend adding the link as a comment in the Stream. While the File field can be deleted from the Grid view, any user that has access to the URL may still be able to download the file. Use a Single Select field to create a set of options to include in a field. 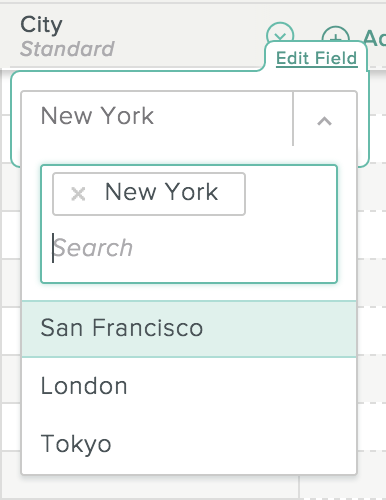 With a Single Select field, you can select only one of the listed options in a field. This is different from a Multi Select field, which lets you select multiple options in a field. 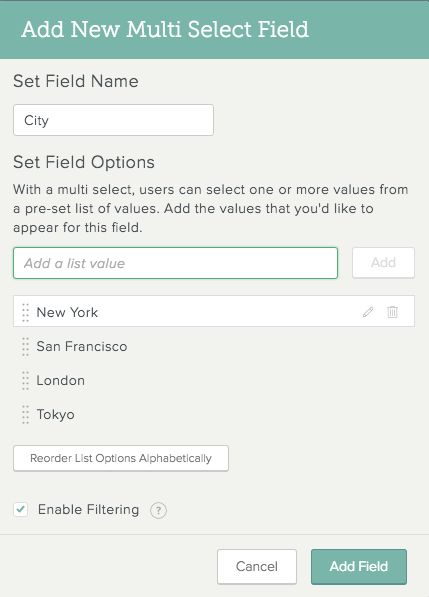 Under Set Field Options, enter one or more values for the Single Select field. Click Add after each one. Note: After you add list values, you can reorder them by dragging and dropping. You can also click the button to reorder them alphabetically. This determines the order in which the values appear in the field. Double-click the field and select the option you want. You can select only one option. Click the field and type the option you want to search for. Click the option when it appears. One of the most common use cases for SalesforceIQ is to manage deals. 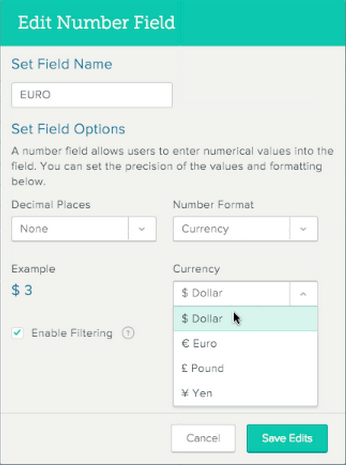 Use a Number field to, for example create a field for tracking deal size in dollars. Decimal Places—To change the number of decimal places shown in the field, click the list and select a different value. Number Format—To change the number format shown in the field, click the list and select a different value. The available options are Currency, Normal, and Percent. Note: You can now choose international currency options, such as the euro, pound or yen. Use a Multi Select field to create a set of options to include in a field. 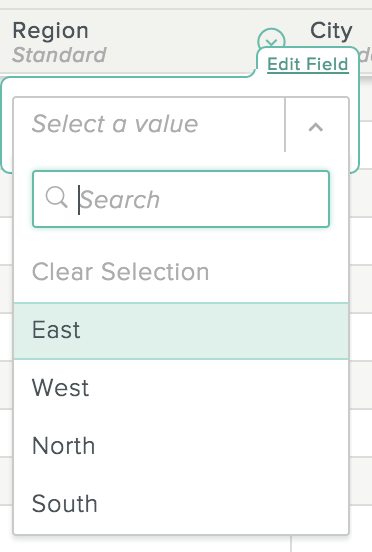 With a Multi Select field, you can select more than one of the listed options in a field. This is different from a Single Select field, which lets you select only one option in a field. 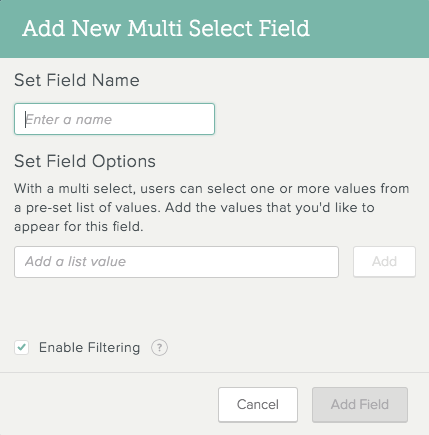 Under Set Field Options, enter one or more values for the Multi Select field. Click Add after each one. Note: After you add values, you can reorder them by dragging and dropping. You can also click the button to reorder them alphabetically. This determines the order in which the values appear in the field. Double-click the field and select the option you want. You can select more than one option. Click the field and type the option you want to search for it. Click the option when it appears. Type another option to include more than one option. 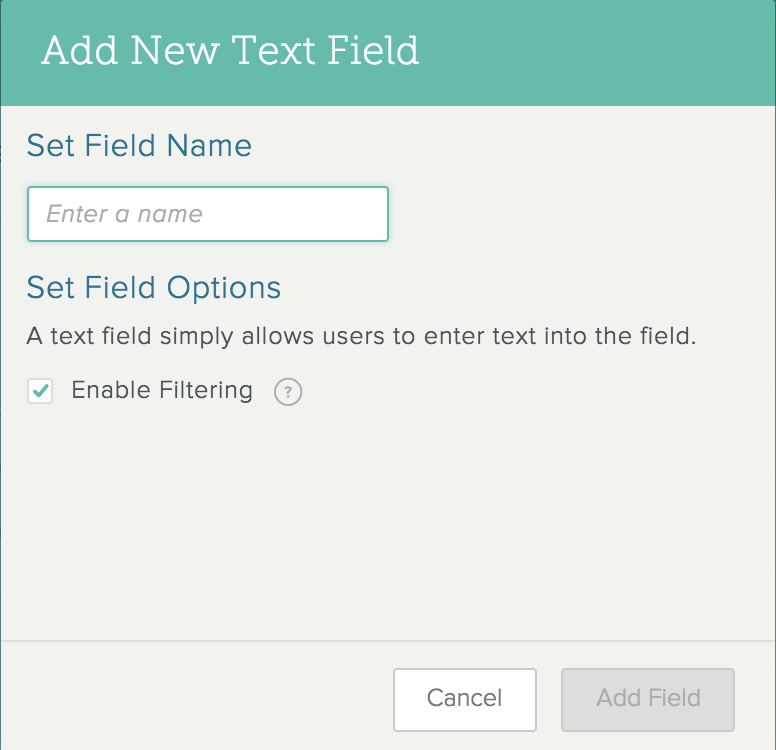 Use a Text field if you want to give users the option to enter simple text in a Grid field. Note: We recommend using either a Single Select field or a Multi Select field where possible for better filtering in the Grid.